Fully restored property with pool suited for up to 14 people. Les Cent Chênes is an old, fully restored stone property tucked in on the southward slope of the hill where the small village of Goussargues is found. 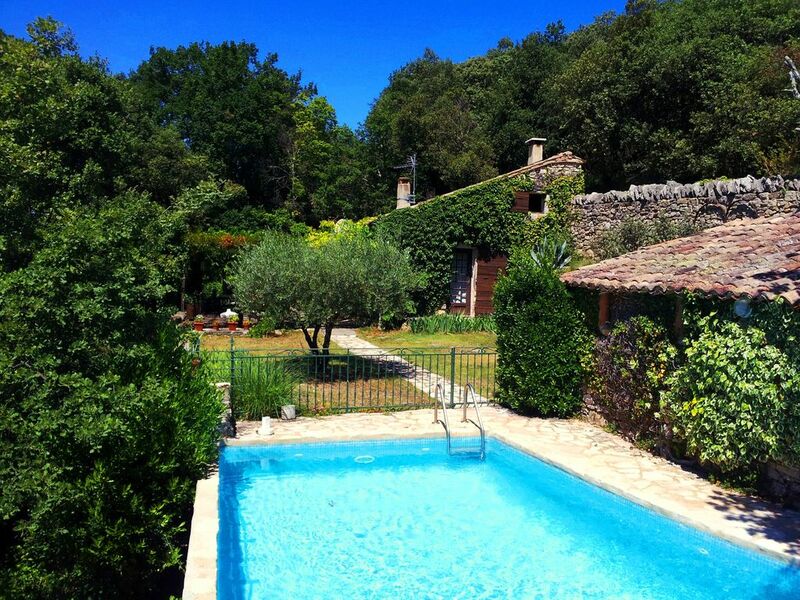 The property consists of 4 cottages placed on a large gardened terrace, hidden by stone walls and oak trees. It is suited for up to 14 people, and can make a wonderful base for the holiday for 1-4 families. All 4 cottages are rented to just a single tenant at a time. A 4m x 7m private swimming pool is included. A local couple maintains the property and pool and is available throughout your rental period for questions, etc. Suitable for families looking for a rustic and close to nature experience. There are half-a-dozen bicycles available for shopping and exploring. A part from the stone villages and old bridges over the river Cèze there are quiet areas for swimming as well. Goussargues is about 2 km from Verfeuil, 6 km from Goudargues, and 12 km from Bagnols-sur-Cêze. My parents originally bought this property, and it has been a family vacation place for me and my 7 siblings for many years, so there are many fond memories of the place, the people and the area. We are a family from Denmark so having such a great holiday place has been a real treat for us all. All rental revenues are reinvested into the property keeping it's maintenance at a high level, yet retaining its unique rustic character. My family and I spent our Easter vacation at this rental property. It was just what we expected. Comfortable beds in private cottages well appointed with individual kitchens and baths. We enjoyed the small town nearby where we went for our daily croissant and coffee. The beauty of the area and availability to nearby day-trip destinations made this a wonderful location for us. The pool and outside terraces were beautiful although we did not have the weather to enjoy them. We are already planning a return trip next year during warmer weather and will book this place again. The place really is a little paradise, with lots of space at different terrains and levels, beautiful nature, a splendid view and with much privacy, on the outskirts of the small and quiet village of Goussargues. In short, the location and ambiance can be appraised as excellent. The accommodation is split across three restored old rural cottages which together offer a lot of sleeping and cooking facilities. We only used the main cottage which is very characteristic yet somewhat crammed with 'collections'. We rate the housing accommodation as good, with lots of charm and very spacious. However one should not expect the highest level of comfort. There is a nice private swimming pool with clean water that is frequently maintained by a very friendly and helpful caretaker. Goussargues is a few kilometers away from Goudargues, which is a very charming village on the banks of the clean river Cèze. We left Les Cent Chênes with very pleasant feelings and would definitely consider to come back. Das Anwesen liegt in einer wunderbaren Landschaft . Einfaches, sehr sauberes Steinhaus, zu Wohlfühlen. Der Vermieter ist unkompliziert und sehr zuvorkommend, auch die Verwalterin Maria ist ein richtiger Goldschatz . Wir haben den Aufenthalt sehr genossen. Das Haus liegt abseits und doch sehr zentral, für Wanderungen, Ausflüge etc. Ich kann das Anwesen jederzeit weiterempfehlen. Great environment for a summer holiday. The outside is fantastic. Nice pool, well maintained by the caretaker. Great terrace, with all you need in terms of places to relax, eat, play, ... The inside is cosy, but a little dark perhaps. But that should not be problem for summer, as you live outside most of the time. Even when it rains, you can sit on a covered terrace. - Rental includes water, electricity, wireless internet, and the use of the telephone for receiving and making local calls. - Cleaning Fee at end of rental €100. - Clean bed linen and towels included upon arrival. - Security deposit of €500 Euros required to hold booking. Refundable within 2 weeks of end of rental. - Local caretakers available during your stay.